Nico Rosberg Has Retired From F1. Oddly I was watching a couple of interviews where he said he refused to think about next year, whether he'd have the number 1 on his car, whether he thought Merc would be competitive, etc.. He said he just wanted to enjoy the moment and that he'd achieved his lifetime goal. I guess that makes more sense now. Seems to have taken Mercedes by surprise too. Real shock this one. Nobody seen it coming. Maybe he wants to have time out,new family etc and come back into,not maybe F1,but possible some other motor sport discipline. I think if I am right in saying,he is only the second World Champion to retire,after winning is first title (Mike Hawthorne-1958) Correct me if I am wrong ? Well who's next in the Merc seat. The team say they will step back to decide who it will be. Could even Ricciardo or Vettel leave their seats and jump at the chance? Maybe Mercedes will bring in some youth from Gp2/3 to be nurtured by the team and maybe Lewis ? Is it possible that one reason for Rosbergs retirement he felt that the team are in for a fight with the car changes,next year,to wider tyres and different chassis ? I can't say i'll miss him. He annoyed me no end. Primadonna. He knows he got lucky beating Hamilton this year. Leaving is good for him, before he gets whipped next year..
To be honest it was a good moment for him to stop. Alonso has to be top of the list, arguably the best driver in F1, still hungry for results, and currently in a disappointing situation with McLaren Honda yet to get up to speed. Possibly Vettel too, although a number of people seem to think he's lost his motivation somewhat.... a Merc drive would probably fix that. Maybe they'll choose someone young and inexperienced, to have a clear No 1 driver in Hamilton and make life a little less complicated. Agree entirely with you Pete that he would find it hard next year. Also with you Pete and Millennium that it was a good idea to go now. FR I also agree that a young driver and forward looking is the way to go for Mercedes.But who is there ? I had thought of Alonso for my first reply but backed away from that. Not sure if they have made up but could Fernando be in the same team as Lewis again(aka 2007) even Lewis accepting Alonso. Should be interesting to see ! Edited by andpan, Dec 02 2016 - 11:15 AM. Verstappen in a Merc would be unstoppable. A ton of talent for a teenager. I don't think he got lucky this year . What happened this year is just the nature of racing. Look at 2008 when Lewis Hamilton stole the championship away from Felipe Massa in Brazil by 1 point. Nico has been racing in F1 since 2006 and 10 years is an average stint in the sport. He's achieved his goal and want's to move on.Who are we to question his decisions concerning his career. I'll admit I was never a fan but he deserves his hard fought victory. He couldn't beat Lewis on his best day and he knows it. Retiring as the winner is all he has. I give nobody credit who takes out his teammate and then makes it sound like it wasn't his fault. LOL..What's the story behind that picture? On 2nd look it's photoshopped. Edited by Pete Gaimari, Dec 02 2016 - 03:19 PM. I remember that Leon. They showed it before the race. Working on his tan. 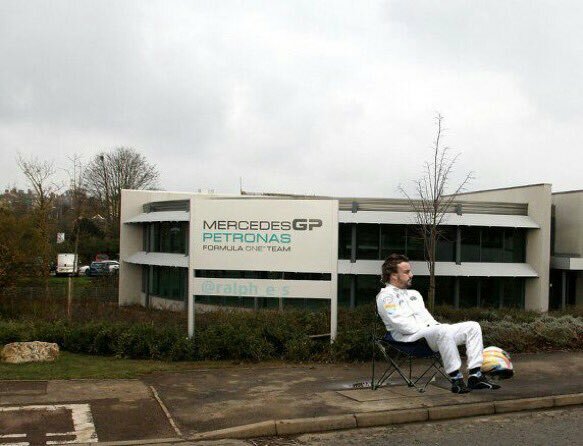 Apparently half of the F1 grid as offered their services for the number 2 seat at Mercedes. Alonso as been strongly mentioned,with even a reversal of his sabatical/retirement in Jenson Button. Nikki Lauda as stated that a young driver,like a werhlein,is out of the question. Maybe Nikki is lining himself up for the seat. Lol !! On other F1 news,the German GP at Nurburgh ring is off. They won't move it to Hockhenheim as the license deal is alternating between the two German tracks. Rumours are the French GP could return. Not at Magny Cours but Paul Ricard. Apparently Bernie owns the track and he will rent it out to the promoters,after stating that not only will the French GP never return,but that Magny Cours is not suitable for a GP. Mmmmmm cloak and dagger stuff here me thinks. When is Bernie going to retire? He must be 150 by now. At least he looks like it.